Why Use Our Misting System? The importance of effective lubrication cannot be under-estimated for both the rider experience and the performance & longevity of the materials. Catch Free: Our misting system is designed to work seamlessly with Proslope matting. The housing fits flush with the mat and the nozzle is slightly recessed in the upper face to avoid any possible contact with snow sports equipment. 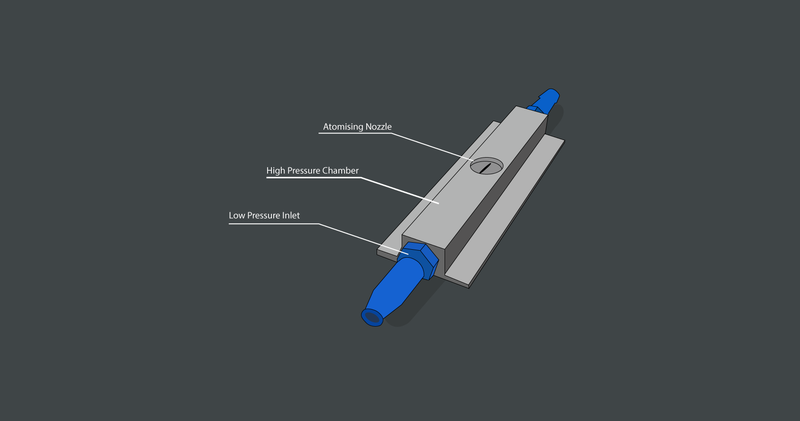 Highly Efficient: The nozzle atomises water into a mist that clings to every filament of the mats. Misting this way provides a much better coating and uses significantly less water than a standard spray system. Modular: The body of the mist system fits perfectly between the mats and can be connected in series or run on pipes in parallel for lower pressure systems. The huge advantage of the Proslope Atomised Mist System is that it has a very even distribution which creates a completely uniform coating, all while reducing the amount of water needed by a third.